The Prime Minister Should Abandon The Fighting Corruption NKRA In His Government Transformation Programme (GTP) If He Dare Not Compel His Ministers And Deputy Ministers To Publicly Declare Their Assets And Set Up A Royal Commission Of Inquiry(RCI) Into The RM250 Million Cows & Condos Scandal. Prime Minister Datuk Seri Najib Tun Razak might as well abandon the Fighting Corruption NKRA or New Key Results Area in his GTP if he dares not compel his Ministers and Deputy Ministers to publicly declare their assets and set up a Royal Commission of Inquiry(RCI) into the RM250 million cows & condos scandal or the RM1,077 billion in illicit money(including corruption funds) secretly taken out of the country during 2000-9. Adakah BN Pulau Pinang Akan Membayar RM40 Juta Sekiranya Kerajaan Negeri Gagal Dalam Rayuan Mahkamah Dalam Skendal Tanah Tang Hak Ju Ataupun Membayar RM14.7 Juta Yang Tidak Dikembalikan Sekiranya Kerajaan Negeri menang Di Mahkmah? Adakah BN Pulau Pinang akan membayar RM40 juta(termasuk faedah 8% sejak Februari 2005 sebanyak RM10 juta) sekiranya kerajaan negeri gagal dalam rayuan mahkamah dalam skendal tanah Tang Hak Ju ataupun membayar RM14.7 juta yang tidak dikembalikan sekiranya kerajaan negeri menang di mahkmah? Kerajaan Negeri Pulau Pinang telah mendepositkan wang sejumlah RM14,678,135.50 ke Mahkamah Tinggi Pulau Pinang pada 18 Mei 2009 seperti yang telah diperintahkan oleh mahkamah pada 19 Febuari 2009sungguhpun skendal tanah ini berlaku pada pentadbiran lama. UMNO and Utusan Malaysia Has Lost Credibility Even Amongst Malays When Utusan Malaysia Was Found Guilty By The Penang High Court Of Spreading Lies And Ordered To Pay RM200,000 For Defaming Me As Anti-Islam And Anti-Malay. Deputy Prime Minister Tan Sri Muhydin Yassin’s attack on DAP as chauvinistic and anti-Malay as well as Utusan Malaysia’s incendiary statement that DAP is the world’s most racist party shows their sheer frustration that more and more Malays no longer believe in UMNO and Utusan until some have even joined the DAP. Utusan Malaysia has lost credibility even amongst Malays when Utusan Malaysia was found guilty by the Penang High Court of spreading lies and ordered to pay RM200,000 for defaming me as anti-Islam and anti-Malay. sacred day shows who is the real chauvinist and racist. Prime Minister Datuk Seri Najib Tun Razak must explain the public benefit of the RM7.07 billion 60-year concession to Kumpulan Europlus Bhd(Europlus) for constructing a 316 km highway from Banting to Taiping and whether the RM 2.24 billion soft loans, 3% interest subsidies for commercial loans for 22 years and RM 980 million grant for land acquisition cost is in the public interest. Europlus had announced that it had received an approval letter to construct the 316 km highway from the Public Private Partnership unit of the Prime Minister’s Department. DAP is curious why the Federal government had still not make any announcement on such an important highway concession which violates the basic principles of public accountability and transparency. Before the government signs this agreement with Europlus, the Prime Minister must ensure that the following 7 questions why Europlus was given such a good deal are fully answered. My family and I are upset at the statement made by Defence Minister Datuk Seri Dr Ahmad Zahid Hamidi in Sibu yesterday, dragging my daughter into his latest spin that the National Service (NS) training programme is now widely accepted and trusted by parents for the positive effect it has on their children. Datuk Seri Ahmad Zahid claimed that both my father and me had seen how my daughter had changed for the better after attending the programme in Balik Pulau NS camp in Penang. This is untrue. My daughter is a good kid and is the same before and after joining the NS Camp. Both my father and I had never told the Defence Minister as claimed by him and neither had we thanked him for it. Penang hopes that the RM4 billion high-tech and solar energy investment by Ibiden and Robert Bosch Solar will be included in the 2011 December investment figures. So whilst the statement made by International Trade and Industry Deputy Minister Datuk Mukhriz Mahathir of a drop in investment compared to last year is correct, the final analysis can only be made when the December investment figure are tabulated. In May 2011, the Penang State Government announced that Penang is targeting to achieve RM6.1 billion investments for 2011. Penang recorded its highest ever investment figures of RM 12.2 billion in 2010 topping the investment charts for the first time in history in Malaysia. A lower figure has been set to attract high value-added, high-tech, knowledge based companies that engender high-income, technology transfer and innovative industries. Saya merujuk kepada lawatan saya ke tapak pembakaran sepanjang Jalan Pantai, Butterworth bersebelahan dengan stesen bas sementara Penang Sentral, di mana 25 gerai dibakar semalam. Pagi ini semasa membuat lawatan saya telah menyatakan bahawa saya akan mempertimbangkan bantuan kewangan kepada mangsa peniaga dan meminta mereka bekerjasama dengan Pejabat Daerah dan MPSP dengan memberikan maklumat. Only Economic Policies That Are Clean, Fair, Competitive And Improves The Well-being Of The People As Well As Attract Back Talented Malaysians Can Help Transform Malaysia Into A High-Income Nation Enjoyed By All(en/cn). The time has come to implement economic policies that are clean, fair, competitive and improves the well-being of the people as well as attract back talented Malaysians that can help transform Malaysia into a high-income nation enjoyed by all. What better time than the year of the water dragon to initiate such changes so that the coming general elections marks the new beginning that would be enjoyed by all Malaysians rich and poor by 2020. 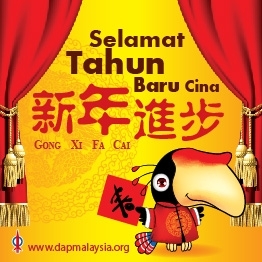 DAP 2012 Chinese New Year Message By DAP Secretary-General And MP For Bagan Lim Guan Eng On 22.1.2012 In Kuala Lumpur. Only Economic Policies That Are Clean, Fair, Competitive And Improves The Well-being Of The People As Well As Attract Back Talented Malaysians Can Help Transform Malaysia Into A High-Income Nation Enjoyed By All. 21.1.2012 In Komtar, George Town. Putting Penang First – The RM500 Million Affordable Housing Fund, The RM8 Billion Road Projects And Transforming Penang’s Civil Service That Is Competent, Accountable and Transparent Will Help Make Penang Cleaner, Greener & Safer. The year of the water dragon holds much promise of making Penang cleaner, greener and safer, which is essential to Penang’s long-term vision of an international and intelligent state. To succeed the state government must retain the rakyat’s faith in our ability and will as well as encourage their unique spirit of creativity and innovation. DAP urges BN to take a bipartisan approach towards promoting transparency and accountability in Malaysia by publicly declaring their assets. Whilst revealing the asset declarations of ministers and their immediate family members to the public may endanger the individuals concerned, as a first step those holding public office should disclose their assets publicly. In the interest of bipartisanship, DAP is willing to start only with Ministers, Deputy Ministers or state excos publicly declaring their assets instead of their family members. Declaring to the Prime Minister alone or only to the Malaysian Anti-Corruption Commission(MACC) is not enough. The Penang State Government has Instructed the State Legal Adviser to issue a gazette notification exempting local authorities in Penang from section 15 of the Local Government Act 1976 as a precursor to seeking a court declaration to compel the Election Commission to conduct local government elections. Chua Soi Lek Should State Which Seat He Is Standing In The Next General Elections So That We Can See His Response If DAP Does A “Liow Tiong Lai Act” By Declaring Confidence Of Beating Chua. MCA President Datuk Seri Dr Chua Soi Lek should state which seat he is contesting in the next general elections so that we can see his response if DAP does a “Liow Tiong Lai act” by declaring confidence in defeating Chua. DAP is not interested in playing the boastful games of MCA, when the only one making political challenges is the MCA and not DAP.